Once a sample ballot has been provided by the Secretary of State, a sample ballot for each precinct/district will be posted here. Please check back after May 1. Voters who are over 65 years of age, permanently disabled, or temporarily residing outside the county are eligible to cast an absentee ballot via mail. Other voters who will be outside the county on election day, temporarily disabled, or meet other certain criteria may cast an absentee ballot in person in the clerk's office. Absentees are available 45 days prior to an election, and the deadline for casting those ballots will be noon on the Saturday immediately preceding the Election Day. Special accommodations are made for US citizens living temporarily abroad and active duty military and their spouse. These voters may vote by several different means, including by email or online. Voters who meet these requirements are encouraged to submit a Federal Post Card Application (FPCA) as soon as possible. Each FPCA will be active for all elections in the calendar year in which it is received. Any person who has not been declared mentally incompetent, who is or will be 18 years of age on or before the next general election, and has not been convicted of a disenfranchising felony crime may register to vote in the county in which they reside. All voters must be registered no later than 30 days prior to an election. You may stop by the Circuit Clerk's office during regular business hours and register. You may also register when obtaining a driver's license or when applying for certain assistance programs. 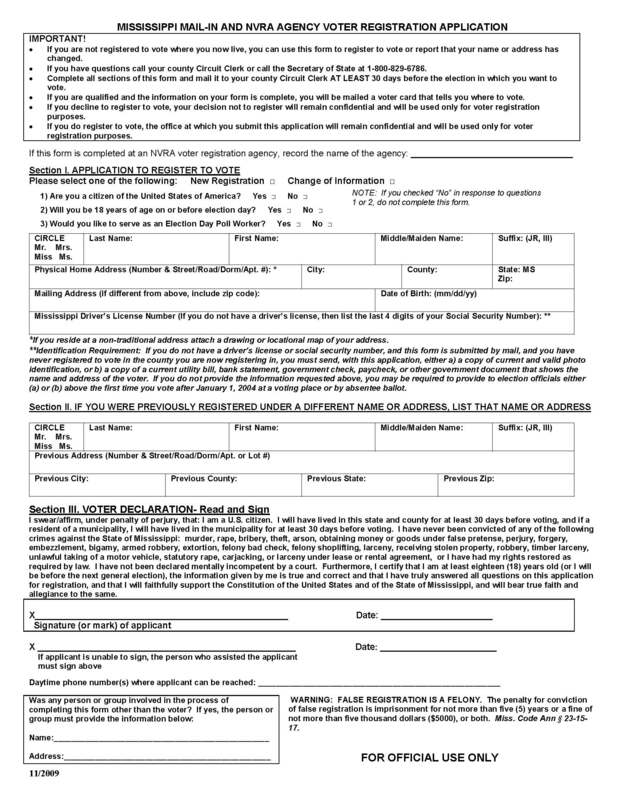 You may also download a registration form here and mail to the Circuit Clerk. You will be asked to provide your full (including maiden) name, physical and mailing address, date of birth, social security number and/or Mississippi driver's license number. You will also be asked if you have ever registered anywhere before. What will I need when I go vote? All Mississippi voters must provide current and valid government issued photo identification when voting, or they will be required to vote by affidavit ballot. Most voters present their driver's license. Should you require a voter identification card, you must contact our office at (601) 394-2379. You may visit the Secretary of State's website for more information regarding voter identification in Mississippi. I've moved and need to update my voter registration. Can I do that online? Yes! Visit the Secretary of State's Y'all Vote website to update your registration online and at your convenience. Changes must be made no later than 30 days prior to an upcoming election cycle.